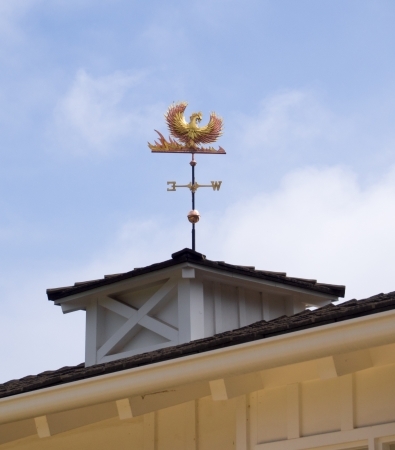 The Phoenix Weathervane was commissioned originally by a couple who were among many who tragically lost their homes to a fire in the hills above the San Francisco Bay. Fortunately, they had a good insurance policy and were able to rebuild the home of their dreams. 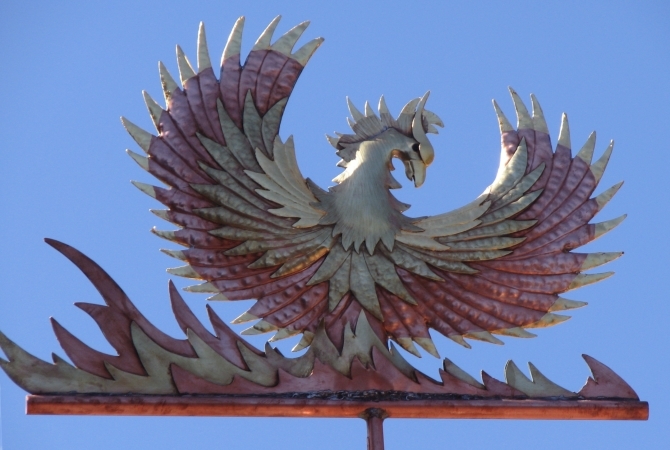 They chose a phoenix rising to represent their recovery from the ashes of their previous life. 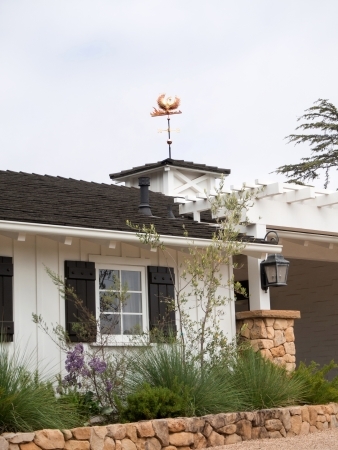 Instead of mounting their phoenix outdoors as a weathervane, they installed theirs as a wall mounted sculpture just above the fireplace mantel, in the living room. A skylight overhead allows it to cast dramatic shadows throughout the day, as the sun moves across the sky the vane’s shadows slowly shift across the wall. And at night recessed lighting reflects off the polished copper and brass to great effect. 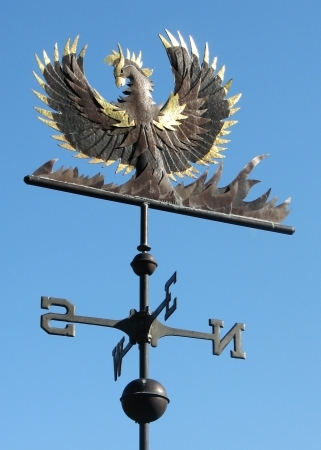 A number of the customers who have ordered this Phoenix Weather Vane are celebrating triumph over adversity. Because of its fiery nature, it has been a particularly popular symbol for new projects replacing buildings previously damaged by fire. 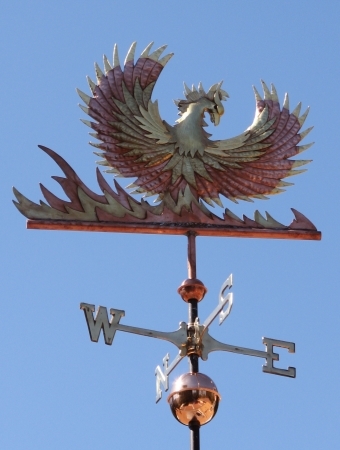 Not surprisingly, this weathervane is also ordered for display on top of fire stations. 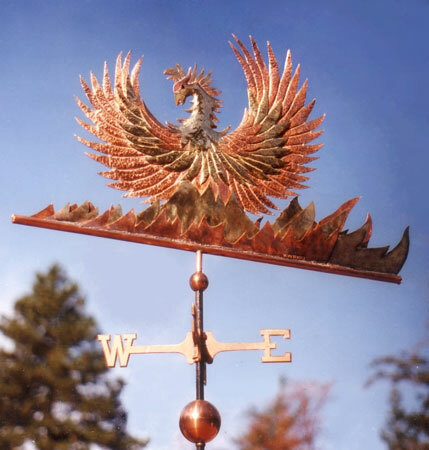 Our personal Phoenix Weathervane, affectionately named after Fawkes, the famous Phoenix from the Harry Potter series, rises out of the ashes of our campfire pit. One night, while sitting around the fire telling ghost stories, we started to hear a strange hissing and spitting noise. Everyone looked up and it seemed as though Fawkes was peering down at us through a billowing cloud, his glass eyes shining, making this fearsome noise. Magic indeed! In reality, the scientific explanation for this wondrous phenomenon was that some rain water had gotten down inside the tall galvanized pipe, set in the middle of our fire pit, on which Fawkes is perched. The water had heated up enough to rise up the pipe in the form of steam hissing and spewing from the phoenix. The effect was very dramatic and now we can’t wait to have campfires with little kids present so Fawkes can do his ghostly trick! This mythical bird of Egypt is a well known mascot for sports teams. It is also a logo in the world of business and for the city of Phoenix. Phoenix was named after this fiery rebirth mythos because the city would rise from the site of the ancient Hohokam people whose original water canals the settlers revived to create a sustaining environment. 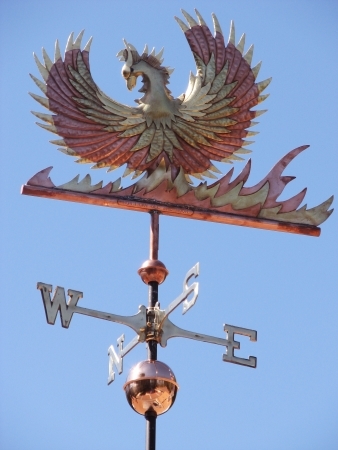 A number of our customers have ordered one of our weathervanes in celebration of their favorite athletic team or to promote their businesses. There is a choice of different colored translucent glass eyes for the Phoenix — red eyes, green eyes, topaz eyes and amethyst colored eyes have been popular. 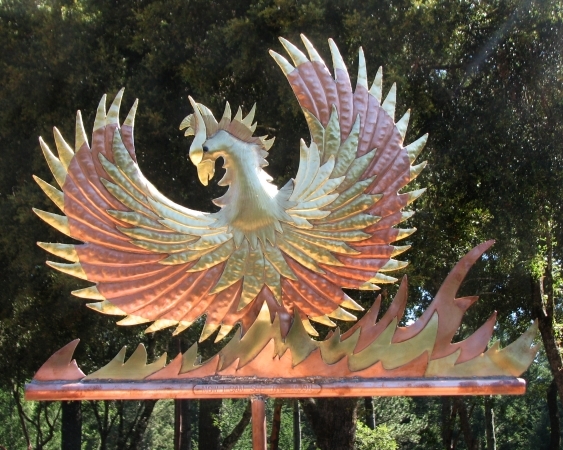 We can make the phoenix entirely in copper or in a combination of copper and brass, and we can add optional gold leafing to catch the light with a golden glow as the phoenix moves in the wind. You can see in the pictures that the gold leafing creates a wonderful bright contrast to the metals as the weather, darken, and eventually patina. In Greek mythology the phoenix is a long-lived bird that is cyclically regenerated or reborn. Associated with the sun, a phoenix obtains new life by arising from the ashes of its predecessor. In keeping with its fiery mystique it has beautiful gold and red plumage. At the end of its life-cycle the phoenix builds itself a nest of cinnamon twigs that it then ignites; both nest and bird burn fiercely and are reduced to ashes, from which a new, young phoenix arises.